The Little Giant® Leveler™ is lighter, easier-to-use, and more versatile than any comparable ladder. The Leveler allows you to complete nearly any task at home or on the job, from changing the light bulb over the stairs to working over unlevel, rough terrain. The Leveler comes with Little Giant’s patented Ratchet™ Levelers, which adjust hands-free in seconds. These integrated ladder levelers allow you to adjust to uneven ground in mere seconds. And when the job is done, the levelers simply retract into storage position. The easy-to-use ladder levelers offer more than 7 inches of leveling adjustment. The Leveler’s spring-assisted Rapid Lock® adjusters are easier to use than manual U-locks. You can use the Leveler in dozens of unique configurations, as an A-frame, extension, staircase and 90-degree ladder, and as a trestle-and-plank scaffolding system when used with Trestle Brackets (sold separately). The Leveler’s wide-flared legs provide an unmatched feeling of safety and stability. The Little Giant Leveler is extra heavy duty rated to hold 300 lbs in all configurations, and will also hold 300 lbs on each side of the stepladder configuration. 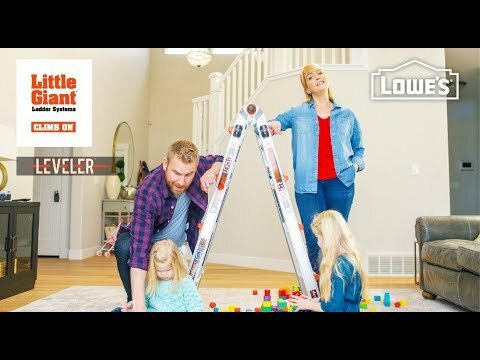 The Little Giant Leveler is available in 17 and 22-foot sizes exclusively at Lowe’s Home Improvement stores nationwide, and in 13*, 17, 22 and 26-foot sizes at Lowes.com. *The Model 13, called the Multi 13, does not include Ratchet Levelers. A-FRAME MIN. HEIGHT 4 ft. 5 ft. 6 ft.
A-FRAME MAX. HEIGHT 7 ft. 9 ft. 11 ft.
A-FRAME MIN. HIGHEST STANDING LEVEL 2 ft. 3 ft. 11 in. 3 ft. 10 in. A-FRAME MAX. HIGHEST STANDING LEVEL 4 ft. 10 in. 6 ft. 8 in. 8 ft. 7 in. EXTENSION MIN. HIGHEST STANDING LEVEL 5 ft. 10 in. 7 ft. 10 in. 9 ft. 9 in. EXTENSION MAX. HIGHEST STANDING LEVEL 11 ft. 8 in. 15 ft. 9 in. 19 ft. 4 in. STORAGE WIDTH AT BASE 2 ft. 2 ft. 3 in. 2 ft. 6 in. MAX. FOOTPRINT 5 ft. 3 in. 6 ft. 9 in. 7 ft. 11 in. RUNG SIZE SINGLE SECTION Inner: 1.5 in. Outer: 1 in. Inner: 1.5 in. Outer: 1 in. Inner: 1.5 in. Outer: 1 in. RUNG SIZE DOUBLE SECTION 3 in. 3 in. 3 in. LADDER WEIGHT 34.5 lbs. 44 lbs. 54.5 lbs. SHIPPING WEIGHT 38 lbs. 49 lbs. 59 lbs.